The first Badger infantry combat vehicle will roll off Denel's production facilities in October 2015 exactly two years after Armscor and the SANDF placed a multibillion Rand order for 238 vehicles, which will rejuvenate the country's landward defence capabilities. The new Badger ICV is a combination of a locally-designed turret and a Finnish designed vehicle, customised for the unique South African conditions. The system will be produced locally and represents the apex of the South African defence industry, says Mr Burger. It will provide South Africa's soldiers with unrivalled firepower, mobility and maximum armoured protection. The SANDF will have an adaptable and flexible vehicle that can be used with equal confidence in both high-intensity warfare and peace support operations. 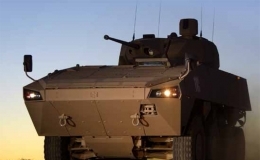 It confirms Denel's role as South Africa's premier producer of world-class defence products and systems and a strategic partner of the SANDF. The Badger is a best-of-breed infantry combat vehicle able to compete on equal terms with any other vehicle in its class. This is the most significant defence contract ever signed with a South African company. It demonstrates the Governments confidence in the ability of the local industry to produce frontline equipment for a modern defence force. The Badger contract strengthens South Africa's strategic independence in the fields of defence and security-related products and support. Through this programme Denel makes another decisive contribution to meet the country's industrial objectives with regards to advanced manufacturing, skills development, job creation and foreign-currency earnings due to export potential. This process also confirmed DLSs position as a strategic incubator of high-tech skills and manufacturing and a leader on the African continent in innovative technologies, says Mr Burger. A unique feature of the Badger is its modular turret system, developed by DLS in five variants, namely Section, Command, Mortar, Missile and Fire Support models. A single turret structure, fitted with different weapon modules, will simplify the logistic support and reduce the cost of through-life support. Although the development phase is still in process, we are confident that the Badger will generate considerable international interest in the vehicle and open a number of prospects for future exports that could result in the injection of foreign direct investment into South Africa, says Mr Burger.